It is 4 in the morning and still pitch dark when we arrive on top of the crater’s edge. After four kilometers and less than two hours, we have covered an altitude of about 500 meters from the starting point. This is not too much, but in part, the stretch was quite steep. The nocturnal view inside the crater is fascinating, even when all one sees is that it goes very deep down and the bottom is fuming and smoking wildly. But one can also, from time to time, see a blue flame down under from a distance: the “Blue Fire”, as the natives call it! From here, the crater’s edge, one can only go further if one has paid in advance and has a breathing mask. It is all checked, even at night. The way forward is steep, rocky and arduous. In the distance there are traces of a few lights of the tourists who have already gone ahead on this path. Again one still needs about 45 minutes to reach the crater lake. Now and then we come across one of the fully loaded sulfur carriers. They are breathing heavily and naturally they have the absolute “right of way”. We tourists have to clear the way in time. 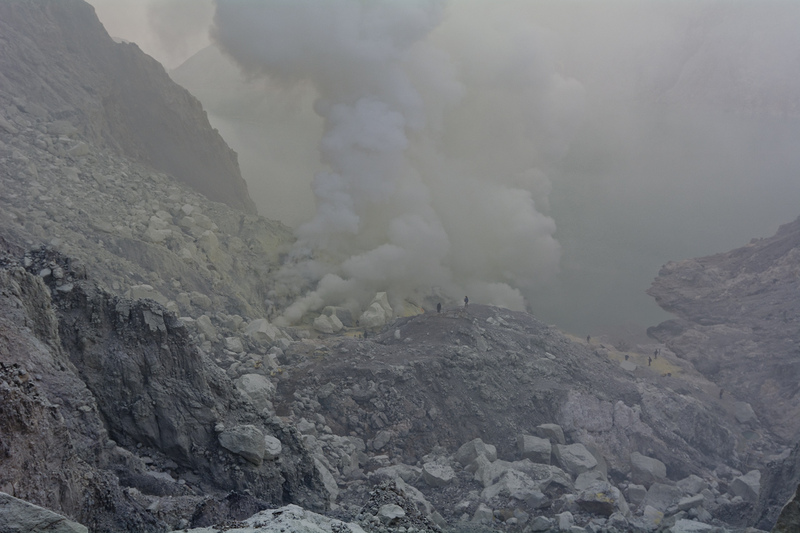 They are coming upwards from the sulfur mines, which are located inside the volcano craters. The tension mounts, definitely! During the nocturnal hikes I reflected upon what drives us, what the real fascination is that especially active volcanoes wield on us humans? I believe that we humans get here a very distant sense of the geological formation of the earth, for the period of a million years, and for the primal forces that our world and we have given rise to. Here, on this open interface between the interior of the earth and the superficial world we can feel the prevailing forces are greater than anything humans can dominate and control, this is the interface towards the unfathomable, towards pure elemental force, towards the origin of life. That is very inspiring! 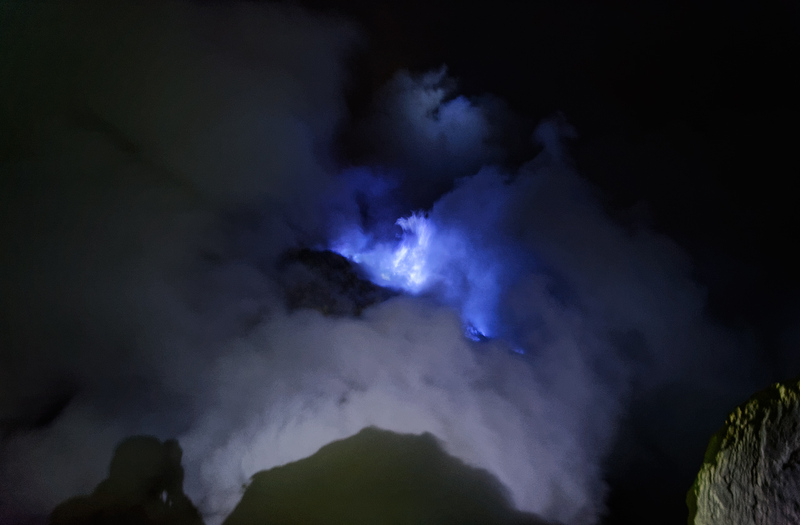 “Mount Ijen” (pronounced: (Idsháyn) constitutes an entire volcano complex in the east of the Indonesian island of Java. 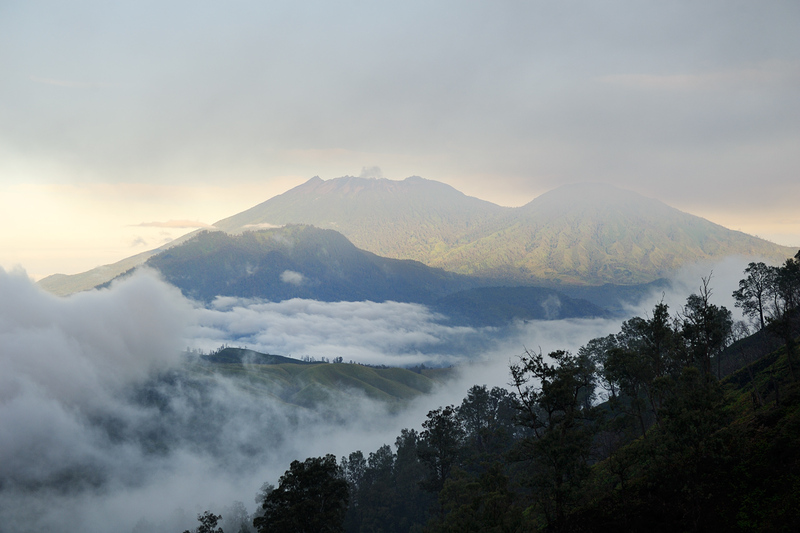 In its immediate vicinity in the southwest, a 3,332-meter high volcano “Gunung Raung” has sprung up. 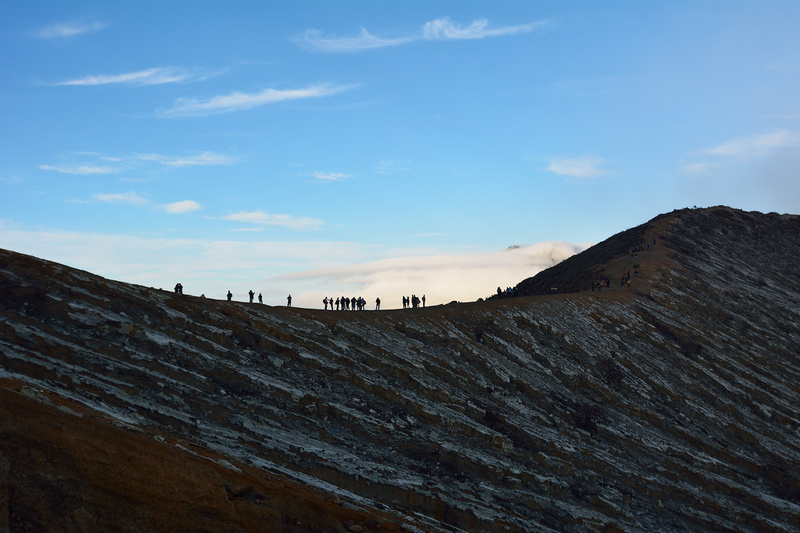 A little further west from it is the famous stratovolcano (composite volcano) Bromo, which is 2,329 meters high and one of the most active volcanoes of Java. 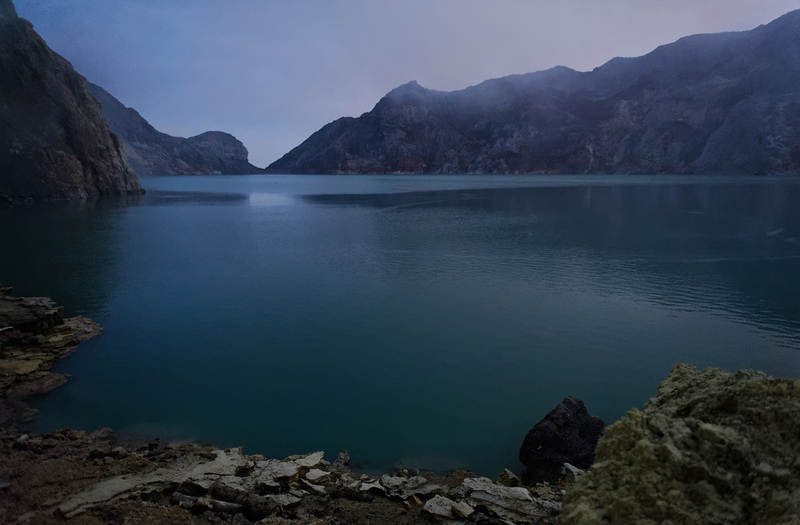 The most special at Mount Ijen (2,386 meters) however is the big lake, “Kawah Ijen” in the inside of its crater, which consists of acidic, turquoise coloured water, as well as one of earth’s most active emissions of steam (solfatara) containing sulfur with enormous hot steam outlet points (fumaroles). Due to its acidic water and violent emission of the steaming solfatara, the lake is termed by geologists as “the biggest acid barrel on earth.” It is 960 m long, 600 m wide, and about 250 m deep; it gets its blue-green colour through its high content of alum, sulfur and gypsum. The water of this lake is extremely acidic; analysis has determined a pH value of under 0.3, pure water of 22° C usually has a pH value of 7. The temperature of the lake fluctuates; in the long-term however, it is slowly rising. It was estimated to be 32° C in the year 2000 and in the following years 35° C to 45° C. The highest upward deflection so far has been 48.1° C in the year 2004. The level of the crater lake is at a height of about 2,120 m.
On the southeast bank of the lake is the greatest active solfatara. 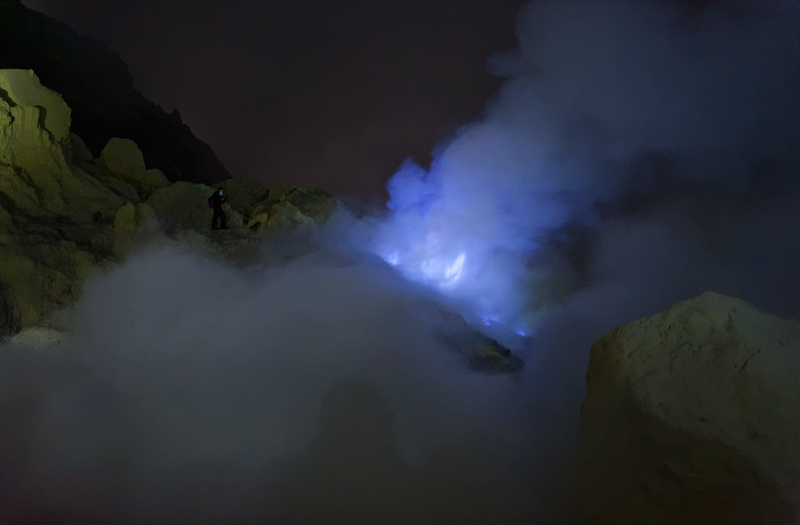 Hot fumaroles of up to 250° C form the largest sulfur accumulation of Indonesia; its sulfur vapour has in the meanwhile formed deposits about 10 m thick. A sulfur mine was opened in 1968 on this sulfur-rich outlet point, in which even today sulfur is mined. 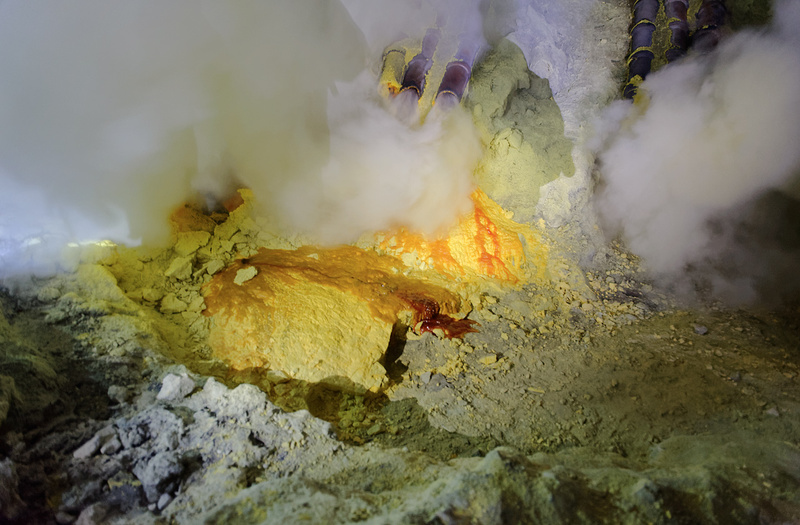 The hot sulfur vapours are passed downwards through approximately 10 m long sloping pipes, where the sulfur escapes in the form of 120° C hot, viscous, and red-orange coloured mass. 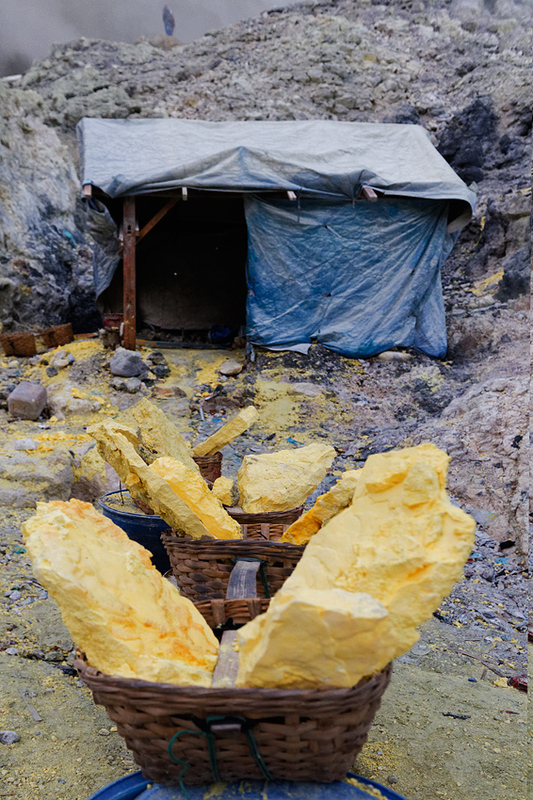 After cooling and hardening of the sulfur, which in the meantime has transformed into a luminous yellow colour, the workers break the sulfur in larger pieces with iron rods. 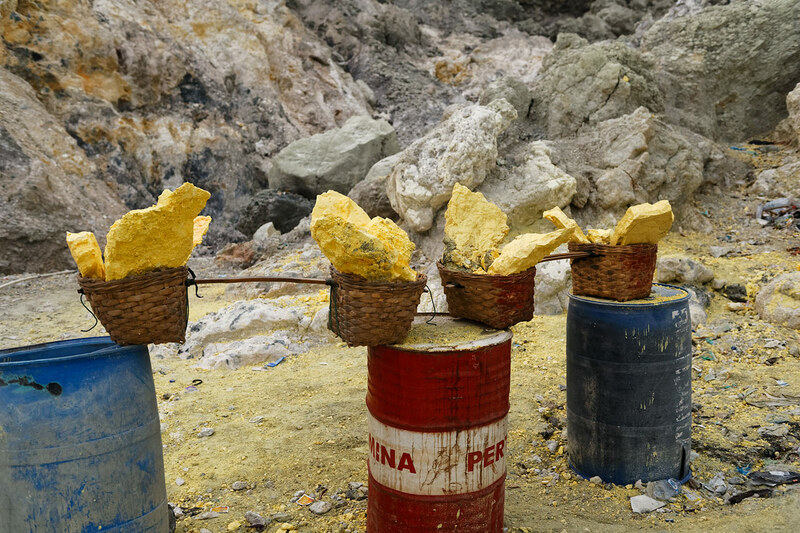 “Hati hati” – “Watch out”, shouts a worker and rams the iron rod in the sulfur till the porous yellow rock splinters. A gust of wind blasts a cloud of sulfur over him, he coughs a little but continues further; small and big pieces of broken sulfur lie around all over. 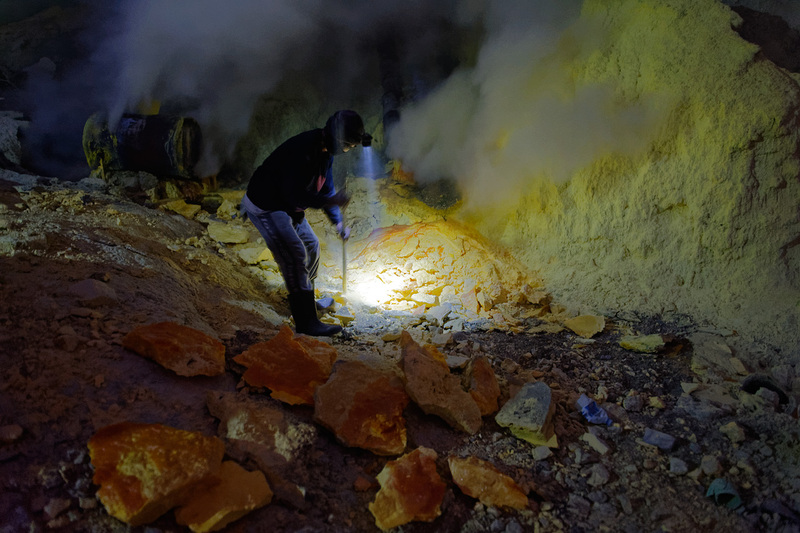 As far as I could make out, these sulfur crushers, who are continually covered in the poisonous sulfur vapour, partly do not wear any masks for protection, only moist cloths. How good these really are for protection, I do not know; at any rate they do not look reassuring, only much too improvised. The company owning the sulfur mine should really not save on this important health aspect. Time and again, one hears the workers coughing, nothing is being said and despite the substance or the breathing mask, the vapours penetrate into the airways of respiratory tract. From time to time it so happens that someone keels over and loses consciousness for a short while, explains our companion, Fendrik. 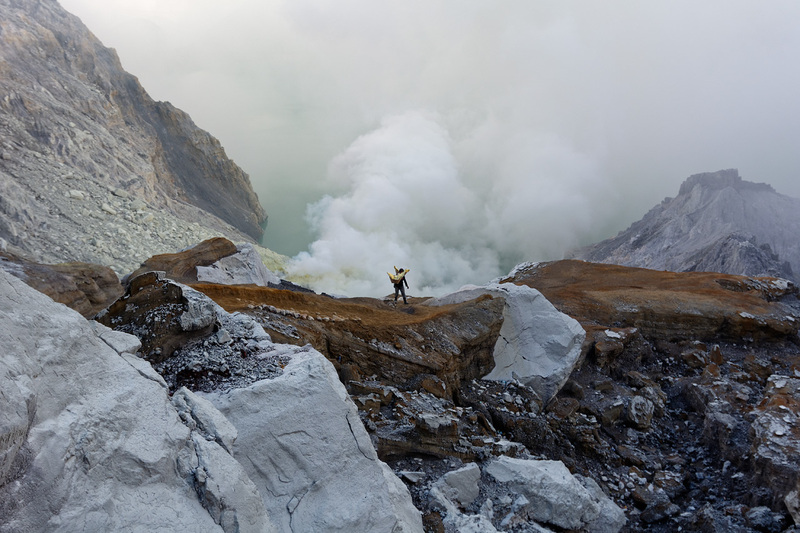 “Because of Ijen’s breath”, they say then, as if the mountain had a soul. But out of fear that it would be interpreted as a weakness, they speak about it reluctantly. It is almost impossible to photograph here, light and contrast are poor, or even to focus properly, especially when the wind blows the sulfur vapour over us! 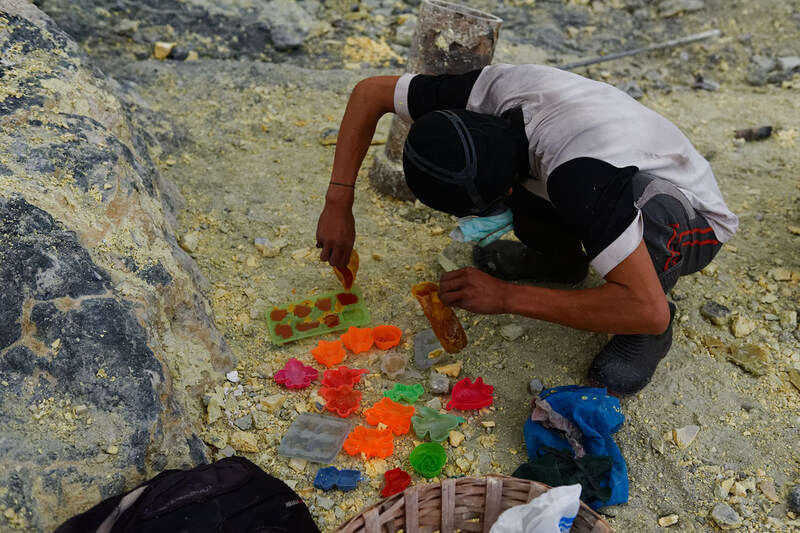 On the edge of this action, a sulfur miner pours the hot and still liquid sulfur into small baby shaped sandboxes, which harden and are then sold to tourists for a few Rupiah, as yellow flowers or small airplanes. 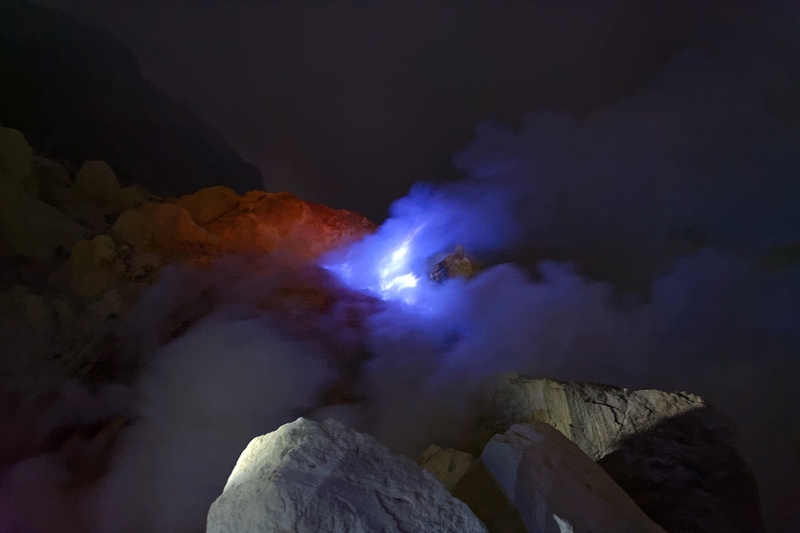 Above the mining site, the gaseous sulfuric acid overheats occasionally and ignites by itself and then burns a deep blue, with up to 5-meter high flames; the sulfur then cools down and furrows into the sea. This very rare natural spectacle is seen best in the dark and it is truly exciting to watch, but just as difficult to photograph. However, one observes very quickly that one should not be in this environment. It boils, hisses and bubbles, the changing wind pushes the cloud of sulfur continually on the face and despite the breathing mask it burns in the lungs. ... attracts the tourists especially at night. 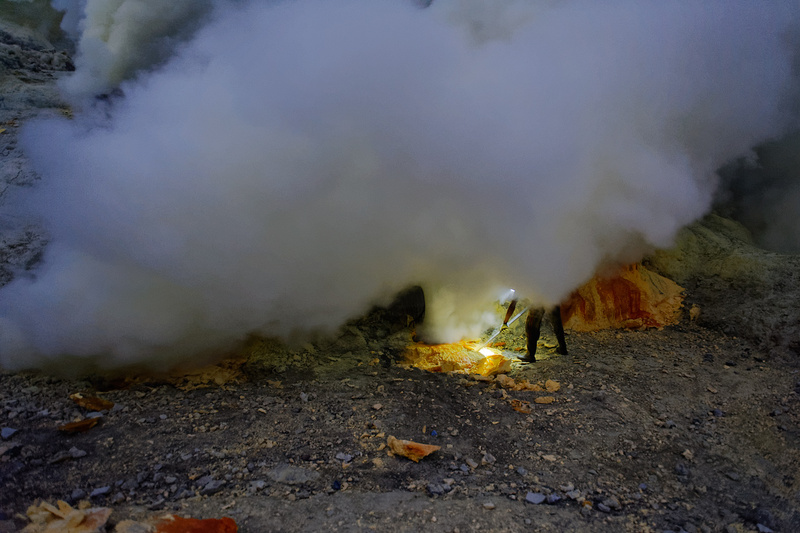 In the escaping vapour, the exhalation of hydrogen sulfide (H2S) is at a temperature of up to 250° C. The hydrogen sulfide is oxidised on contact with air and it results into deposits of elemental sulfur, and also partly iron sulfide, as well as in the formation of sulfurous acid (H2SO3). 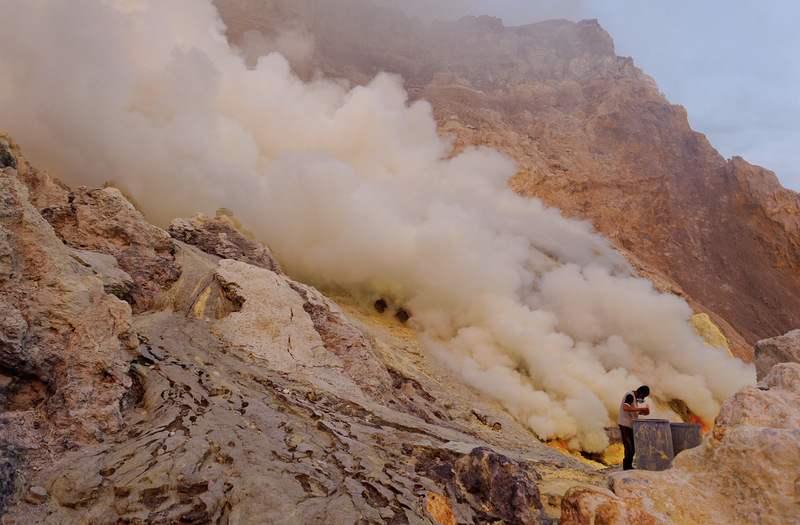 This sulfurous acid can also cause the surrounding rock to deteriorate and is also dangerous for the workers. In the Middle Ages, such sulfur deposits were, for e.g. in Iceland in Námafjall, an important source for the production of gunpowder in the whole of Europe. 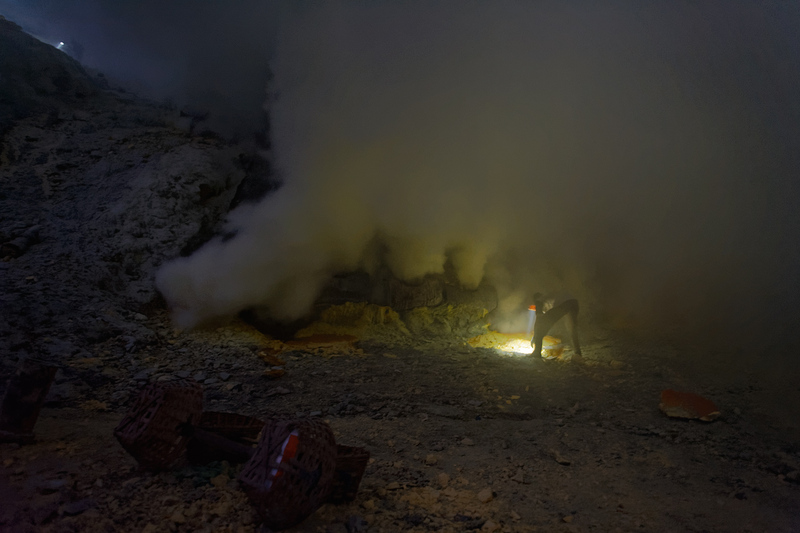 The broken sulfur is transported from the crater of the volcano by the sulfur carriers, a few of whom we met during our nocturnal climb into the crater. This is real hard work and thanks to Fendrik, we were able to get some information from these people, as besides a couple of words they do not speak any English. 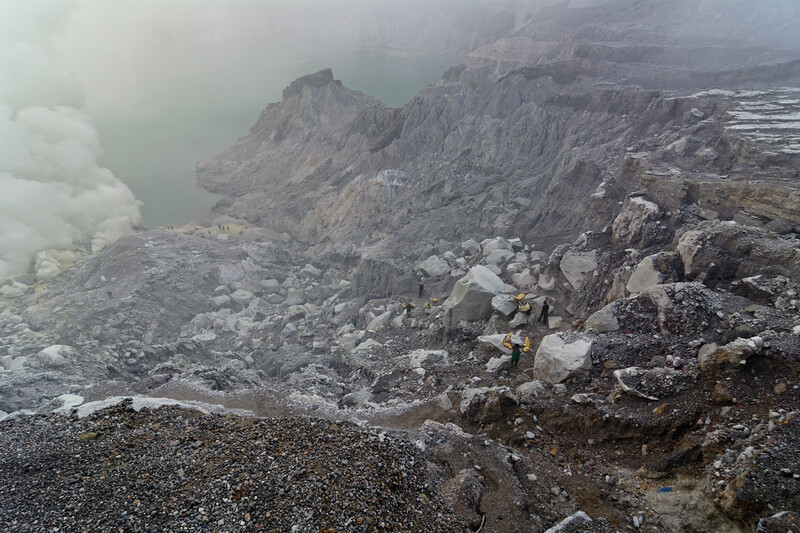 All together 220 sulfur carriers work for the sulfur mine on Kawah Ijen. At the age of 13 one can take an entrance examination, which entails climbing up the mountain and then down again from the other side, carrying 40 kilos. There is a temporary contract for this, a fixed transfer into the “Guild”, but only when one can heave 60 kilos per delivery up and down the mountain. The strongest among them manage over 90 kilos per delivery! 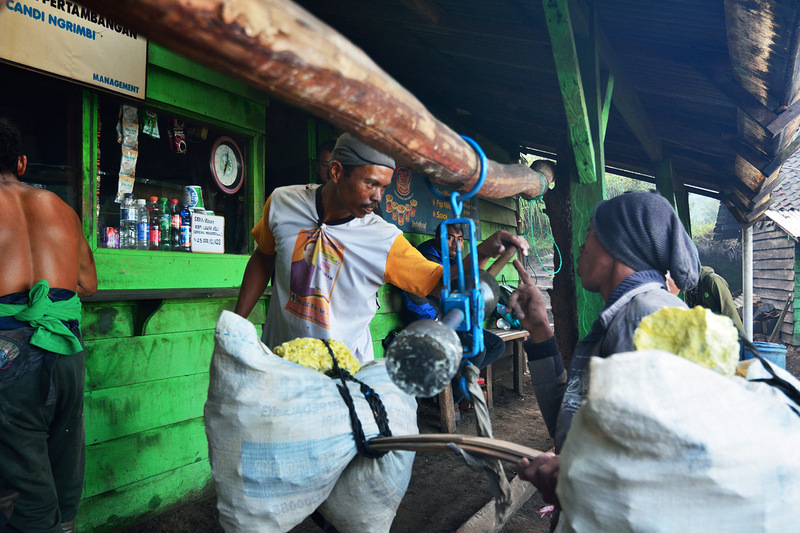 Presently, the workers get 1,000 Rupiah for 1 kilo sulfur (6/2015: 1 Euro = 15.109 Rupiah). As a rule, the workers go down into the boiler twice in a day, so that they carry, shall we say, 80 kilos and earn 10.57 Euro per day. That is four or five times more than a rice harvester or coffee picker earns. But half of it goes to the sulfur miners down in the sulfur mines. Nevertheless, it is comparatively a good pay, so the few free jobs are in high demand. In the long-term, however, the health of the workers is ruined. Their life expectancy is ten years lower then the average population – about 50 years, says Fendrik. These heavy baskets must be carried at this height. 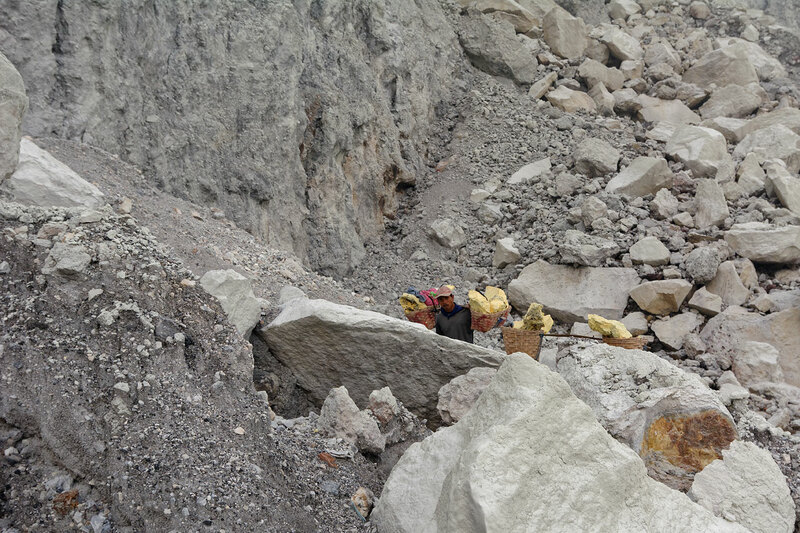 The workers carry between 70 and over 90 kilos up and down the mountain. 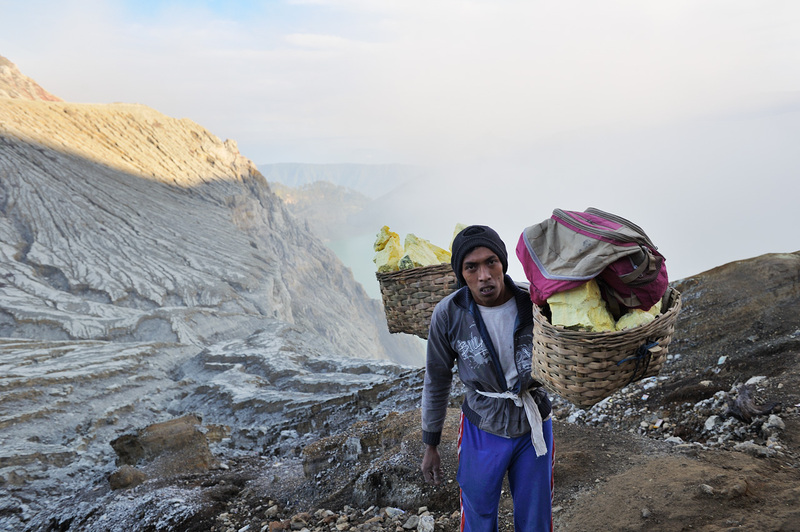 Sulfur carrier on Mount Ijen. The effort is written all over his face. 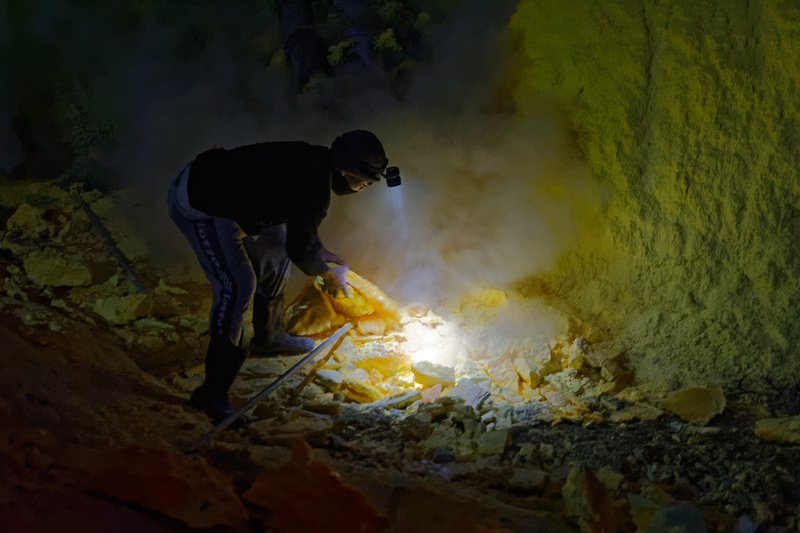 “In a month we work for 10 to 15 days in the sulfur mine, the rest of the month we spend with our families; many of us have another job as well, for e.g. in the sugar factory,” one of the sulfur carriers tells Fendrik during a break on the crater’s edge. Day and night, the workers heave their load upwards, in the nights it is pleasantly cool and not so overcrowded as in the day. 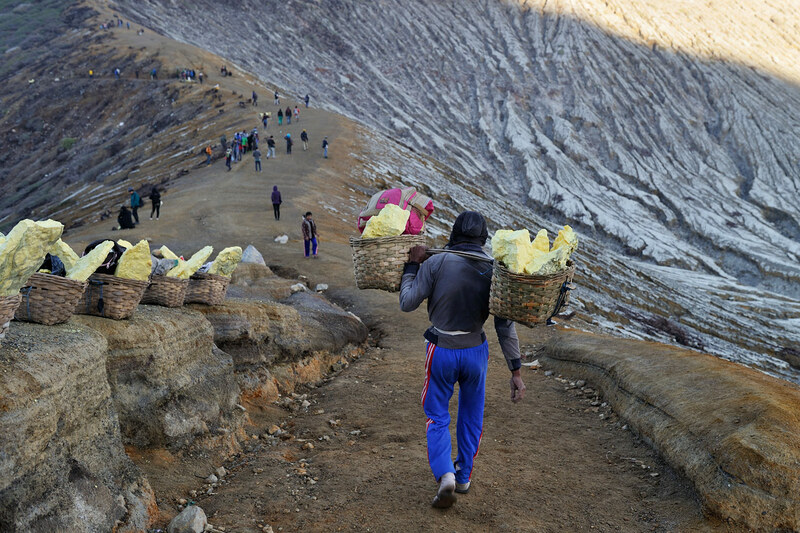 The sulfur haulers transport the broken sulfur pieces in two bamboo baskets over the 200-meters high crater’s edge to the valley. The baskets with the sulfur pieces hang on a strong rattan pole, the weight is then well balanced. Their passage to the top moves slowly, teetering lightly in rhythm of the steps, the step in flips-flops and toe-socks or in large rubber boots is concentrated and firm. The heavy weight moves forward step by step, and is heaved up slowly but surely. Through the see-saw movement, they relieve their shoulders for a moment, which probably makes the duration of the journey a bit more bearable. At definite and distinct gaps, the load is placed on the other shoulder in a rapid rotational movement and in similar distinct gaps short breaks are taken. That is why time and again one sees full baskets parked somewhere or the other. 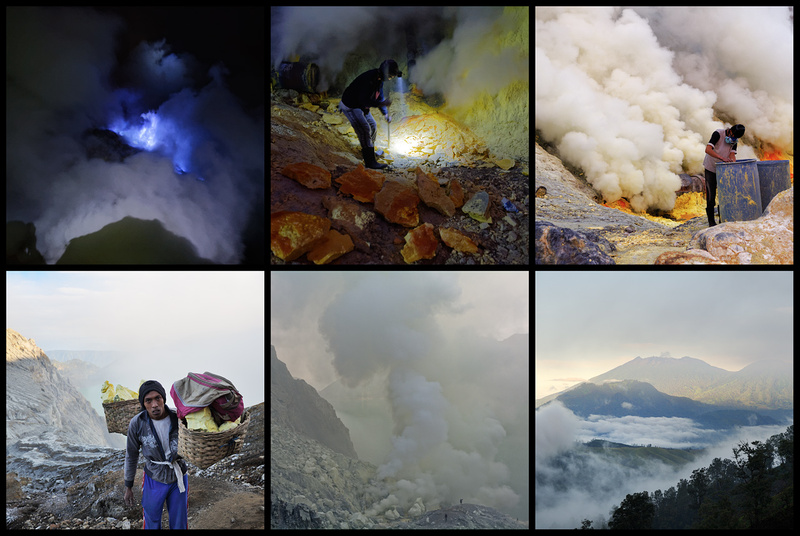 Most of them are happily smoking a cigarette… approximately seven to eight tonnes of sulfur per day are hauled to a collection point at the foot of the mountain. 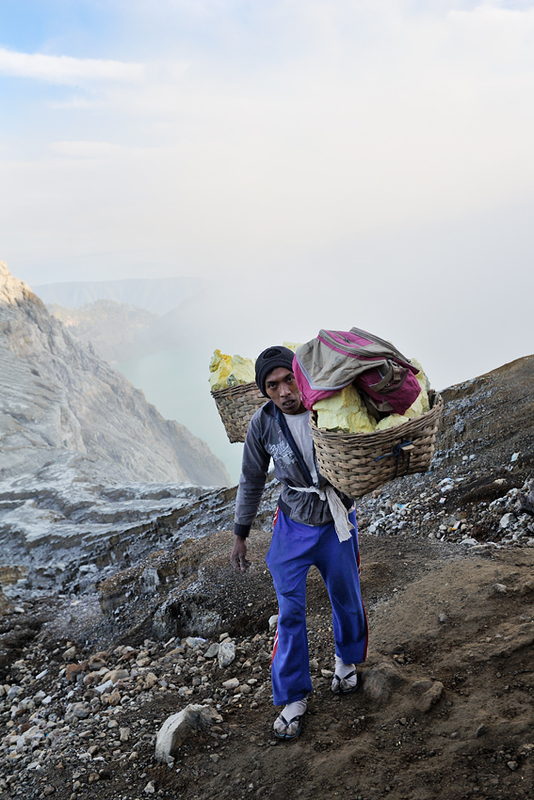 Sulfur carrier on Mount Ijen. One who does not have a basket, uses sacks. On the way down, after about a kilometer, we come to a weighing station. Here, the rattan poles are hung precisely in the centre on a hook and the exact weight is determined. The sulfur haulers watch out to ensure the weight is correctly read, because their future payment depends on it. They get a receipt for the weight they have carried, for which they will receive payment later. Thereafter they carry both baskets further down where these are then loaded on to a truck. The walking technique of climbing down is totally different from climbing up. Here they take short, quick steps three at a time, it looks like they are trotting lightly or nearly running. They relieve their knees and muscles with each step so that they do not slow down at every step. 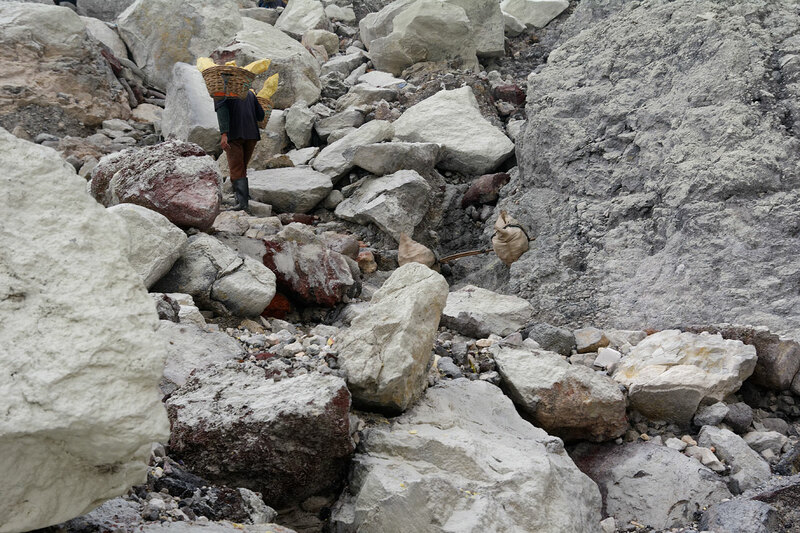 The truck brings the sulfur to the nearby town, Licin, to the company called PT Candi Ngrimbi, which has bought the license for the mine from the government. In the factory, the sulfur is heated in an oven, that is, it is liquefied and then cleaned off of stones, earth and sand. The company buys and works on the sulfur here only because it can obtain it at a cheaper price locally than buying it on the global markets. Sulfur is a waste product of natural gas and crude oil distillation and therefore it exists in abundance. The cleaned sulfur is then sold to the sugar refineries in the country, where it serves to bleach the sugar. Even the pharmaceutical and chemical industries located at a distance of about 200 kilometers in the provincial capital Surabaya are buyers, for e.g. for the production of medicament and also fertilizer. • 1817 - a huge eruption of a fountain of sludge catapulted out of the lake and buried innumerable people and fields under it. • 1976 - 49 out of 50 sulfur workers were suffocated due to a gas eruption. • 1989 - further 25 sulfur workers died because of a gas eruption. Previously, after heavy rainfall, the acidic water of the crater lake flowed over the edge of the crater and caused severe damage to the rice fields and sugarcane plantation in the north coastal plains. That is why a sluice was built in 1921, which prevented the arbitrary flow of acidic water. The walls of this sluice are made up of sulfur blocks, because no other construction material can withstand the acidic water for a longer duration. Sometimes it is good and also right that man embraces nature. Actually however, he has nothing to look for in such a place, neither as a worker nor as a tourist. And still the entire volcano world wields upon us this unique fascination, even though it is so dangerous. Or perhaps because it is indeed so dangerous? Because it brings us close to our Creation, or because the universe allows us to be an inconsequential witness? 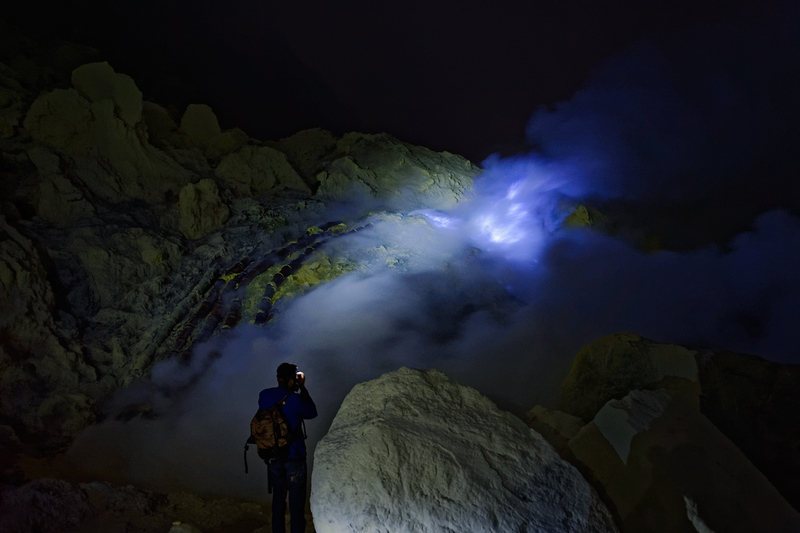 When one stands there and looks back into the crater, or when one sees the blue flame, the sulfur that has ignited because of over-heating, and which flows from deep inside the earth, one experiences not only a beautiful spectacle of nature, but also first hand the unbridled violence of our Earth’s interiors. In places like this, nature shows us, time and again, its original form and force. What we should remember is that we are dependent on it and not the opposite.